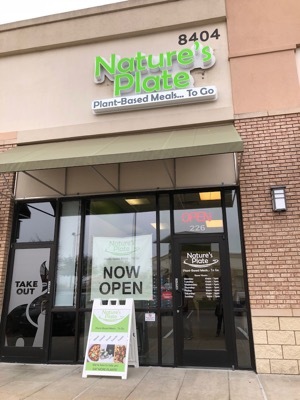 The all-vegan Nature's Plate recently opened a new location in DFW. Photo by Andrea Ridout. Two Dallas sisters have discovered the secret to getting adults to eat their veggies. Make it delicious - and make it easy. 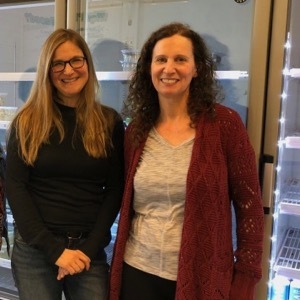 Marianne Lacko and Annette Baker started their first all-vegan food venture - Nature’s Plate - in a Lake Highlands shopping center in Dallas in 2015. Sisters Marianne Lacko and Annette Baker opened their Plano location in February. I recently visited their new Plano shop, which opened in early February – less than a year after they launched a second location at Preston and Forest. The stores offer tasty grab-and-go meals you can eat at home or in the office. Just heat it up, if necessary, and enjoy delicious, healthy meals. All food is prepped at the east Dallas location with daily deliveries going to the smaller storefronts. Greenies will be happy to know that packaging is reusable plastic or compostable containers so there is minimal waste. 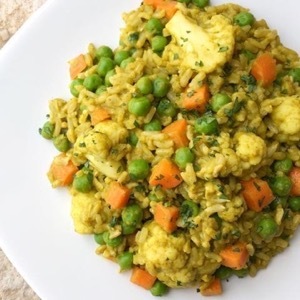 In addition to prepared foods, Nature's Plate offers classes and meal plans to take the worry out of what’s for dinner. Back when I ran an eco-friendly hardware store in the same shopping center as their east Dallas location, my staff and I would often buy lunch at Nature’s Plate, which was just a few doors down from us. These vegan enchiladas are made with mushrooms, quinoa and lentils rolled in a corn tortilla and topped with a cheese sauce made from cashews and potatoes. 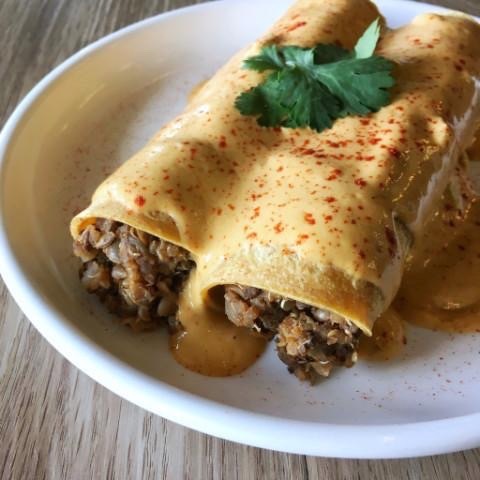 Marianne tells me that many of our favorite dishes are still big hits - including their Mexican offerings, especially the vegan enchiladas with creamy sauce. “The barbecue plate, anytime we have that, we tend to sell out of it. It’s really popular!,” said Marianne. I also couldn’t get enough of the Veggie Mac. Marianne let me in on the ingredients. I think the cheese sauce is the magic ingredient that makes it soooo yummy. I would often pair that with one of the Nature’s Plate kale salads and a nutty vegan muffin and enjoy the lunch of champions. Annette noted vegan doesn’t necessarily mean healthy. At Nature’s Plate, they make sure that all of their food is not only good but is also good for you. Sugar and oils are minimized as well. The gals also make all of their delicious sauces right in the Lake Highlands kitchen, even down to the salad dressings. My favorite is the bowl-lickin' Lemon Tahini – and they generously offered to share the recipe with all of us at GreenSourceDFW. See Lemon Tahini Dressing recipe. Marianne has some advice for those who want to follow suit. 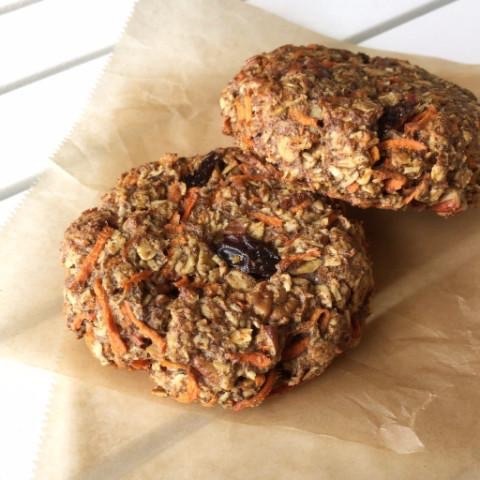 Carrot cake breakfast cookies make a tasty morning treat. “The easiest thing to do is to crowd out the bad stuff with the good stuff. Add vegetables and or whole grains and or beans to every single meal. Crowd out the meat and the dairy and the eggs.” She recommends to start with a few veggies that you like and to include them at every meal. Eventually, she insists, the good stuff will take over. Like most success stories, Nature’s Plate took years of planning. While working as vice president of operations for Telvista, Inc. and studying at night, Annette received a certificate in plant based nutrition from eCornell. Marianne developed many of what would become the pair’s signature dishes in the evenings after a busy day at Goldman Sachs where she was vice president in information technology. Annette eventually left her job to pursue professional cooking full-time in 2014 followed by Marianne not long afterwards. In 2015, they opened the Lake Highlands Nature’s Plate and have not looked back. About: Dallas-based food venue featuring to-go items and meals made with plant-based, whole foods. Meal plans available.